My birthday is always in November. Nothing I can do about that. It creates some controversy as people can’t figure out why I always want to go hunting on my birthday, which is November 21st. November 21st is usually the end of the first week of pheasant hunting. It’s the week the the goldeneye return to Mayberry Slough. It’s the first week of fall turkey season and the week that we generally start flooding up on Webb Track. This year is was also the week that my venison arrived from Montana along with the horns of the mule deer buck bagged on November 5th. The week before my birthday is probably the best week to hunt whitetails in Idaho. This year it was a good week for working on our new bathroom at the ranch. Only a few things left to do before it will be functioning. Photographed this tule elk bull on the way to the ranch last week. My birthday is almost always on the week before Thanksgiving, which creates a little bit of a social conflict. But, not much. Last Wednesday, I managed to hunt ducks and also pheasants – something that used to be common, but now is a special treat. Webb tract rooster bagged on birthday week 2015. The week before my birthday can be a great time to catch a striper in the Delta, especially if the duck hunting is slow. This year, brother Rob caught this nice striper during the week before my birthday. On birthday week this year, my nearly two year old grandson, Fergus Kelly, accepted the warthog tooth I handed him and then carried it with him the rest of the night. Now it’s at his house. The large tooth of this warthog is now in my grandson’s possession. On my birthday this year, I slept in and drove to the Kerry Club for an afternoon shoot. Turns out I may have been better off if I’d hung with the guys in camp and had a bloody Mary. However the sun and fresh air did my spirit good and Lola had a good workout while crashing tules on way to and from the blind. About 1:30 PM a few pintails arrived high overhead, but they never approached. Now my freezer is full of deer meat along with the cape of my muley which I’ll have mounted this winter. I’m looking forward to seeing the tall and symmetrical buck on my wall along side of the whitetail I killed during the week before my birthday a few years ago. I hope the Montana mule deer is as attractive as this Idaho whitetail, which is a favorite of mine. All things considered, November 21st is a good day for a birthday. The weather was snowy and cold. The wind howled – just what you’d expect from a November wilderness experience. The falling snow limited our visibility on the first day of hunting to the extent that my hunting partner, Alden Glidden, and I elected to spend the afternoon cutting firewood. It was obvious that we’d be burning wood continuously for the next four days. A crew of 3 guides put up the wall tent and stove, created a tarped entryway to the tent, set up an auxiliary tent for storage and set up cots in the tent for four people to sleep. A large camp stove would burn enough wood to keep us comfortable and well fed with hot food. Our second guide for the week showed up at the end of daylight and the group was reduced to four. Two guides, Colter Heckman and Shance Hall, along with two hunters, Alden Glidden and myself. Our spike camp was at about 7,000 feet on the continental divide. Four horses remained in camp for hunting. About a foot of new snow greeted us on the first morning’s hunt. Along with the snow came a bighorn ram that apparently was lost as no sheep are known to reside in the Bob Marshall Wilderness. A lone set of deer tracks crossed a saddle near camp and Colter exclaimed that they looked like they belonged to a big muley buck. Our first day of hunting in a prime deer area produced no mule deer, but Colter did spot some elk about a mile away. We elected to leave them be and hunt for mule bucks instead, but none appeared. On day two we rode the horses off trail while hoping to find mule deer in timber. We found plenty of tracks but not warm bodies. As we arrived at the saddle where the buck tracks were found the day before, Colter suggested that I sit and wait for the buck. It was about 2:30 PM when I took up a position about 85 yards above the saddle. I brought a rest and water/wind resistant clothing so I could stay motionless while waiting for the buck. The temperature seemed to be in the teens and the wind was howling with gusts at 30 miles per hour. As the buck would not stop for long in the saddle, I had to remain ready. A few seconds would be all the time I’d have to judge, aim and shoot if the buck appeared. At about 3:45 PM. I glanced away from the saddle and then back. Without notice, the buck was standing directly below me. I took the safety off, glanced through the scope and saw a shooter buck. No time for examination beyond that. As I readied to pull the trigger, I could see the buck tense his body in preparation to exit. He began to move forward as I squeezed off the shot. He hunched up and walked in a circle. As he completed 360 degrees turn, I finished him off with a second shot. I had my buck. After walking to the buck, I could see the 4×4 antlers on this right side, but wasn’t sure that he had four points on each side. As I pulled his remaining antler from the snow, I was elated to see that both sides were perfectly matched with long tines. The buck was quite nice and what I was looking for. With a perfectly matched set of 4×4 antlers about 20 inches high, I immediately pronounced him to be perfect for my wall. 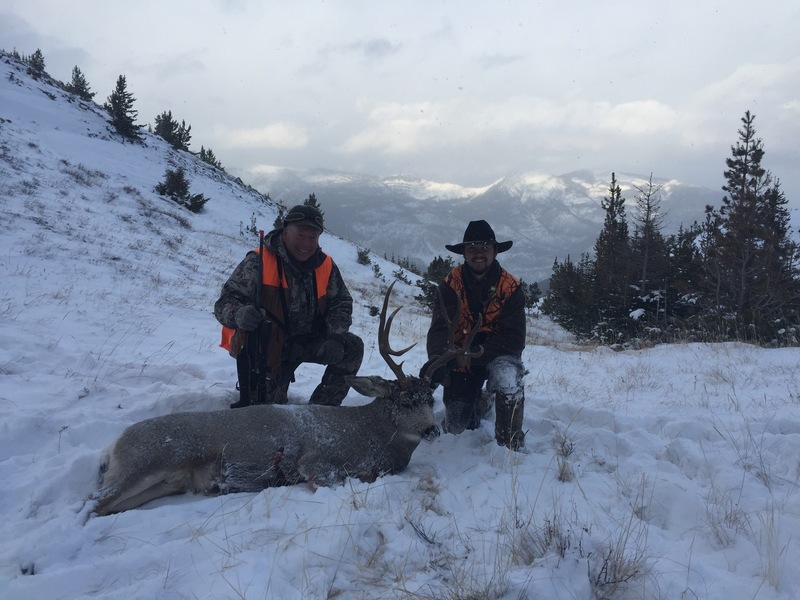 For many years I had hoped to one day kill a big buck in the Montana wilderness and now I had one to call mine. Grizzly bear, mountain lion and/or wolf tracks were observed every day. The deer of the wilderness live their lives under the constant threat of predators. In addition to being pursued by human hunters, they are also a primary food source for wolves and mountain lions as well as a supplemental source of food for bears, both grizzly and black. In addition to the bighorn ram, elk and mule deer, we also observed three moose, one a large bull. While watching the three moose, a wolf howled from about 150 yards away. Having wolf tags, we attempted to attract the wolf by howling back at him, but he didn’t come. Later we walked over and found his tracks and the tracks of a second wolf. We followed their tracks for a ways, but they were long gone. I guess they weren’t impressed by our howls. Left to right, Shance Hall, Dr. Alden Glidden and Colter Heckman pausing at the trail head on the way home. Rocky Heckman and his crew at Montana Safaris did a great job of providing for us and allowing us to enjoy some of the wildest wilderness in the U.S. Finally bringing a wilderness buck home.